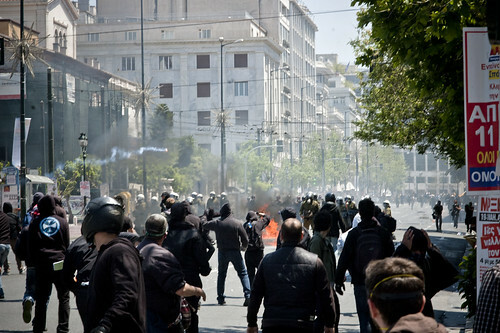 Athens has been especially tense for the last ten days. Social and political conflict is escalating. Ten days ago at the general strike, riot police beat an anarchist demonstrator into a coma and hospitalized dozens more. When repressive governments feel that they are losing control, when they fear the spread of an idea, they resort to brutal repression. One only needs to look to Syria right now to see this at its extreme. As the ruling class clings to power in times of crisis, intimidation becomes the weapon of choice to assert dominance. After the unprovoked attack by the police on the tail end of the general strike demonstration, protesters responded to the police onslaught with a barrage of rocks, powerful fireworks, and molotov cocktails. Running street battles flared throughout downtown Athens, migrating towards the friendly streets of Exarchia. Dumpsters again burned in the streets to block the movement of riot police. 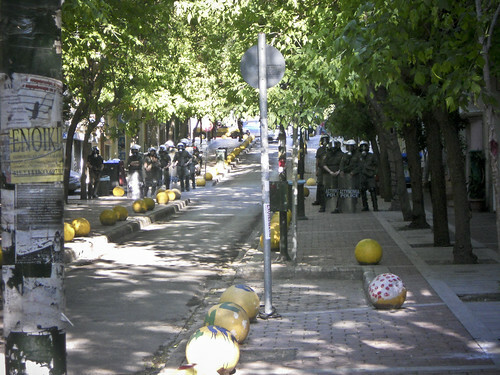 Dozens of young anarchists carried out hit and run attacks on riot police from the Polytechnic University, a place police are forbidden to enter. 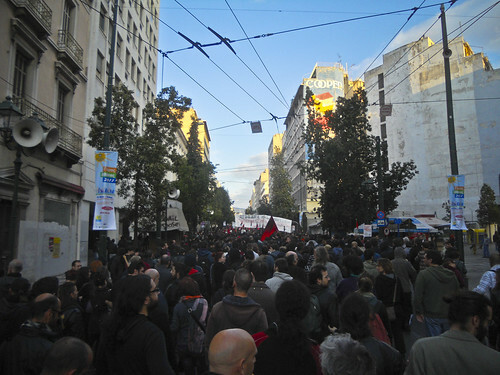 Hundreds more occupied Exarchia square and the streets surrounding it. Firefighters arrived when police could clear an area long enough for them to extinguish the burning dumpsters and barricades. The march started at 11 am, and the street fighting didn't end that night until 8 pm. That night an assembly was called to figure out an appropriate response. The plan was to have it at the usual venue for anarchist assemblies, the Architectural campus of the Polytechnic. Unfortunately the school was surrounded by riot cops, and the meeting had to be moved to the nearby Economics campus. Despite the change, about a hundred people showed up. One person introduced the topic and demonstrators discussed it for the next three hours. The meeting had neither a facilitator nor a formal process. When one person was finished talking, someone else on the other side of the room would pick up and offer up their opinion. The meeting was full of people who were constantly rubbing their eyes and sneezing as the smell of tear gas saturated into peoples clothes wafted out. By midnight, they had decided that the next morning at 8:00 AM they would occupy the campus that was closest to downtown. There was going to be a demonstration against the police later that day, and holding that space was key to having a base to fight from. The next morning, the best in 90s Greek punk blared out onto the morning rush hour crowd from the steps of the newly occupied university. A huge black banner reading "Dolofonoi" (Murderers) was draped down the front of the building. 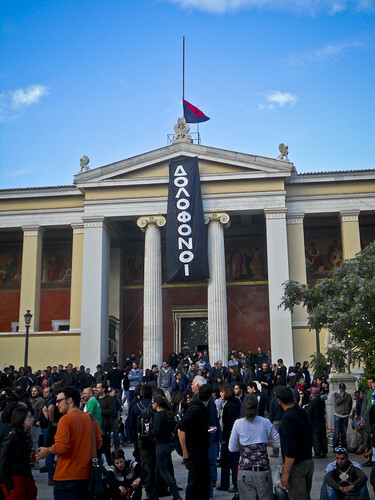 The Greek flag on the top of the roof had been replaced by a red and black one, while slogans and circle-As were spray painted across the front walls. Dozens of pissed off anarchists sat back and relaxed as confused passersby gawked on their way to work. Throughout the day hundreds of people gathered on the steps and in the halls. 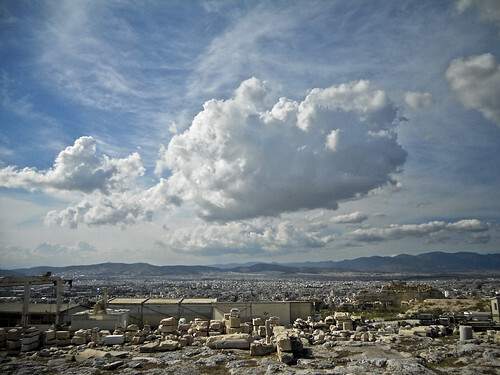 A communiqué was written and posted to the internet in both Greek and English. Thousands of flyers about the previous day's police beatings, the occupation, and the 5pm anti-police demonstration were handed out to everyone on the busy street. By the time of the march, over 5,000 people had assembled. Hundreds of participants wore or carried motorcycle helmets and wielded wooden rods mounted with black and red flags. The only police presence was a small squad of riot cops a few blocks away and about five more intelligence officers standing on the top of a building attempting to photograph demonstrators’ faces. Throughout the night the police maintained a considerable distance from the march, which was quite different than at the general strike, which was heavily policed. The assumption was that this distance was for their own safety. When the cops did get within throwing range, they were pelted with the usual projectiles (rocks, molotovs, and fireworks), as well as small propane canisters which were detonated by the (Greek equivalent to) M80s that were taped to them. Experienced street fighters came prepared with hammers in order to break off chunks of marble from walls, steps, and planters, providing endless munitions for attacking the cops. Throughout the evening, most of the militant demonstrators ended up back on the steps of the university. Again, whenever the police were close enough, they were met with a rain of stones. Another assembly was taking place within the safety of the campus. After a few hours of discussion, they decided to leave the university in order to fight against another enemy -- fascists. A few days earlier, a man was mugged for a camera near Victoria Square as he left his home in the early morning to go with his pregnant wife to the hospital. He resisted the mugging and was stabbed three times by his attackers, who fled and left him to die. This area is home to scores of migrants, and Greek fascists capitalized on this fact to incite brutal pogroms against anyone who didn't look Greek. Over a hundred people were attacked the following week, almost 50 were stabbed, one was killed, a number of businesses were ransacked, and countless more individuals were chased away. A far-right group called Golden Dawn (of which hundreds of police officers from Athens belong to) headed the campaign of violence, as the Nazi concept of collective punishment was implemented by these crazed nationalists. As expected, the police let it happen. Several videos have been posted to the internet of the police standing by idly as mobs of fascists beat immigrants. Another video filmed from an apartment balcony shows the police letting two fascists out of the back of a police car and replacing them with two migrants, presumably to keep the number of arrests from a fascist demonstration in line with what they had reported to their higher ups. Anarchists and Antifascists geared up and organized a massive resistance to these racist attacks. The squat of Villa Amalias is situated only a block from Victoria Square, an area that fascists are attempting to 'cleanse' of migrants. Inside the gates to the courtyard of the squat sits a neatly organized arsenal of rocks, sticks, and bottles as well as dozens of helmets. The anarchists would be attacked by riot police if they were to occupy the square, which would probably scare off anybody using the space, migrant or otherwise, and thereby defeat the purpose of making the space safe for immigrants. The strategy then was to wait at the squat for the fascists to come to the square, then to ambush them. The fascists have been occupying an intersection about 6 blocks from the park, and after a few failed attempts to attack migrants and the squat itself, they seemed to have learned that their stupidity will get them hurt. 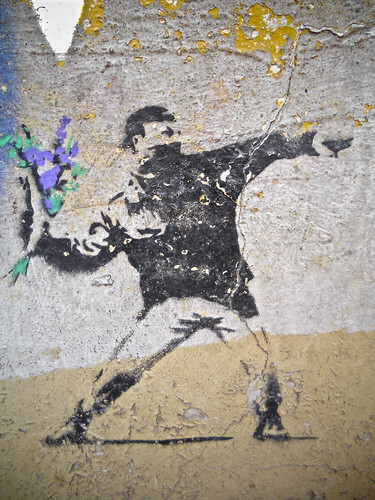 A day after the fascists and riot police mounted a failed attack against Skaramanga, another nearby squat, the media began reporting on the rampant violence in the city. The police PR machine ensured the 'objective' journalists of the corporate press that they were doing everything in their power to curb the attacks against migrants, and that they were working hard to preserve order. Subsequently, the mainstream media depicts police as the saviors in this chaos. These events were a convenient distraction from the economic crisis that plagues Greece, and the police are quick to ensure people that they are the only ones who can 'bring order' to this tense situation. Antifascist demonstrations, attacks on fascists themselves, and self-defense by migrants are the only things actually keeping immigrants here safe. 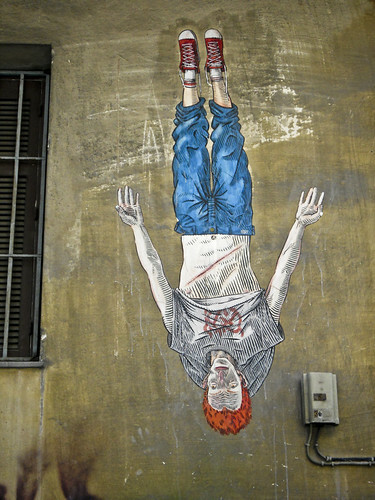 Athens is a city where the ordinary citizen has very little faith in the police. They are generally untrusted and seen as brutal right-wing gangs. If you call the police in need of help, they are unlikely to even show up. However, they occupy street corners in full riot gear, always at the ready to administer justice as they see fit. 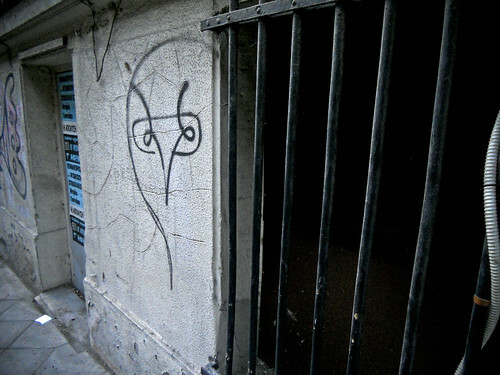 One week ago from today, a group of about 50 anarchists attacked the police station in Exarchia with stones and fire. Several police cruisers and motorcycles were burned, as well as a few personal motorcycles owned by cops. As the group left it was perused by a motorcycle cop. The anarchists nailed his vehicle with a molotov and the officer fled. The motorcycle exploded and injured three people who were at a nearby market, including a flower seller who was seriously hurt. A few days later, members of the group wrote a statement clarifying the intentions of the attack and expressing deep regrets for the injuries. Many anarchists here are drawing comparisons between this event and the burning of the Marfin Bank one year ago that left three bank workers dead, an event that has been paralyzing to militants, who are now calling their tactics at demonstrations into question. Both events have been labeled as reckless attacks carried out in total disregard for human life. But there is a huge difference between recklessness and accidents. Police vehicles, in the collective experience of the people here who burn them regularly, do not typically explode. The injuries caused by this event are terrible reminders that yes, injuries to innocent people will happen. Every possible precaution could be taken in preparation for an action, but there is no guarantee that nothing will go wrong. Yes, this event is regretful and tragic, but does it actually devalue the message that was sent to the police? The brutality that was carried out against protesters on May 11th will not be tolerated. 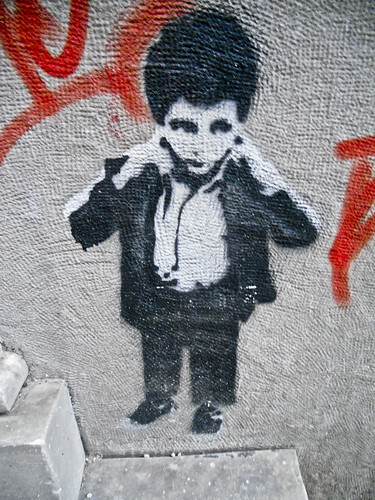 Between the brutal general strike beatings, anti-police demonstrations, fascist pogroms against migrants, anti-fascist demonstrations, attacks on the squats, regular street battles with police, injuries from the exploding motorcycle, and a failing economy, the anarchists in Athens have felt an abrupt escalation of the intensity in social struggle. Only a few weeks ago people were talking about life here being in a slump. Anarchist activity was in a lull and they weren't sure how exciting the prospects were. But today they are struggling to find time to rest as they go from meeting to demonstration to assembly to their job (if they managed to land a job) or to school. As the outlook for the economy worsens, the prospect of more intense conflict rises. Economic instability and a widespread growing distrust for capitalism equals more people looking towards radical solutions to find a better world to live in. 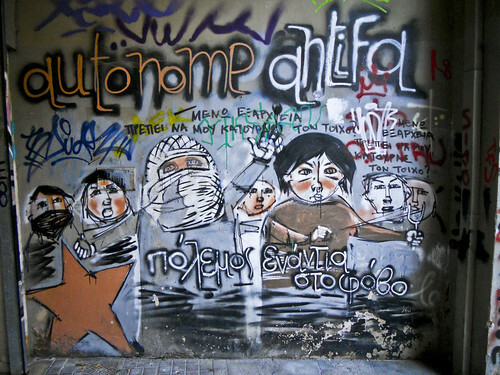 While a few are distracted or even enticed by the anti-foreigner message of the fascists, an expanding section of society is looking farther towards the left for solutions, and a growing number of those people look even further, towards anarchism. The politicians here and the police that protect them and the capitalist agenda fear this. They fear the example set by anarchists, and are doing everything in their power to both demonize them and to show others the kind of repression they will direct towards people who stand up against them. 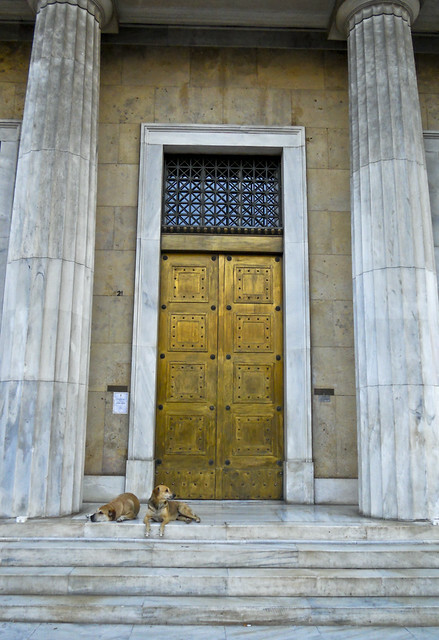 But the Greeks have a long history of standing up against state repression. In many ways the whole world is watching Greece. As governments are challenged and toppled in Northern Africa, people are watching from afar wondering if the economic crisis will be enough to tip the scale and send Greece on its way to becoming be the first European country, the first democracy, to collapse under the weight of massive social upheaval. 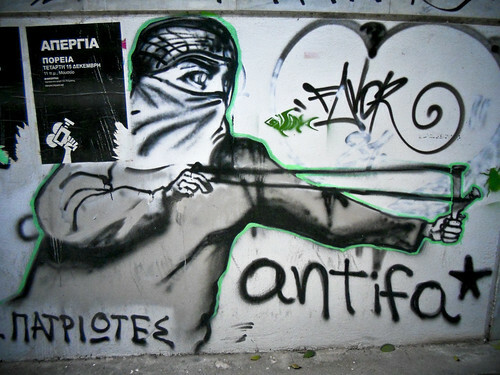 In less than one week, Athens will host one of the largest anarchist gatherings in the world, which will bring somewhere between 20,000 and 40,000 radicals together for a five day event featuring speakers, workshops, movie premiers, and live music. Anarchists from across the globe will congregate in a city that is famous for being a center for radical militancy against the state. It is unlikely that anything historical will happen, but with so many anarchists in one place at a time with so much social tension, things have the potential to get very interesting. i think you did a good job of incorporating many of the different things that seem like they have been going on concurrently into this post. i thought that the statement that acknowledged responsibility for that blown up motorcycle was incredible and unlike anything i'd ever seen. i'm curious what the context for that was, or what greeks in the a scene thought of that.